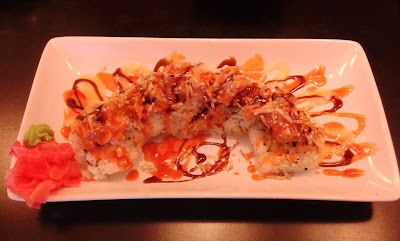 Trying to find a good sushi restaurant in Langley has been one of my greatest challenges for me since starting this blog. 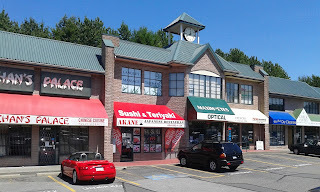 My previous sushi excursions to Langley were quite eye-opening, featuring unagi topped with Worcestershire sauce, Tai Sashimi that I could confuse with mashed potatoes, and this one rare incident in which my favourite item of the meal ended up being the iced water. 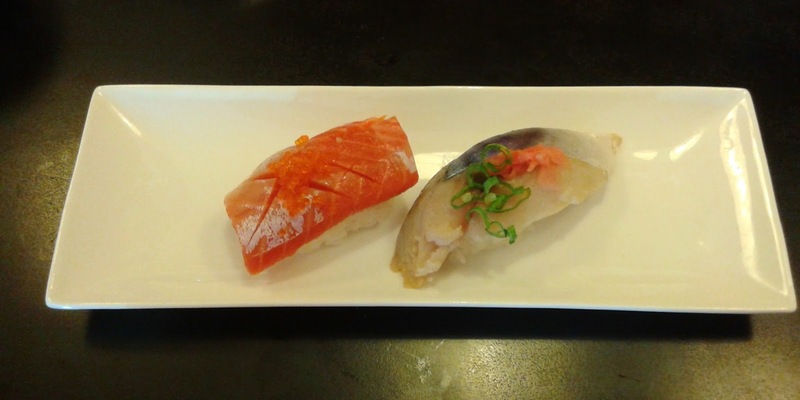 Still hopeful that I would be able to find an above-average sushi restaurant in Greater Vancouver's city of rich farmlands, I decided to visit Akane Japanese Restaurant, reportedly one of the best Japanese restaurants in Langley. Akane Japanese Restaurant is a moderately small Korean-operated Japanese restaurant in Walnut Grove (which spans the north part of Langley). When I walked into the restaurant, I was quite surprised to see that all of the tables were occupied by diners who were busy enjoying their lunches. This was the first time I had ever encountered a near full house at a sushi restaurant in Langley, which made me hopeful that I was going to get good food this time. I managed to avoid a wait by grabbing one of the last remaining seats at the small sushi bar. I ordered the Akane Lunch Special Combo ($12.95), which entitled me to a Miso Soup and allowed me to choose a special roll and an appetizer (from a small list). The Miso Soup came with tofu and green onion and was served at the right temperature. The miso paste was quite rich, but it was a notch too salty for me. 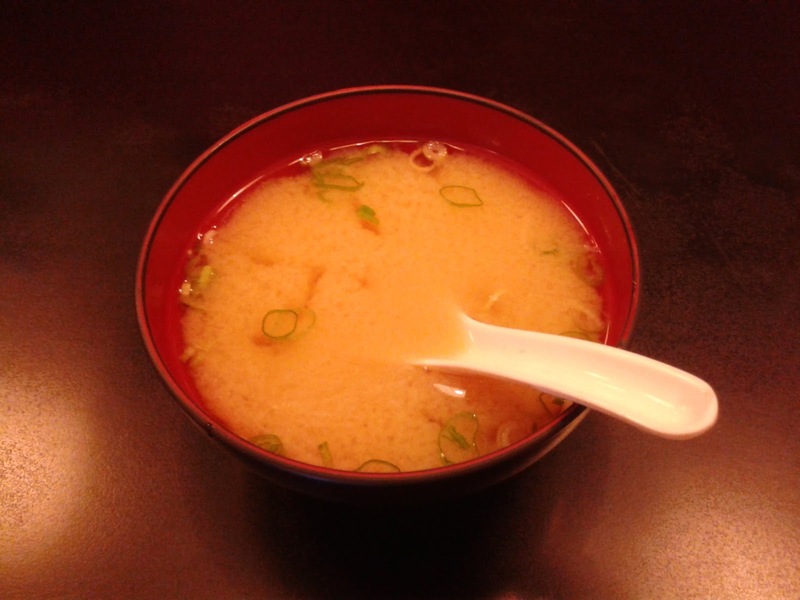 Merely seconds after I had finished taking a picture of the Miso Soup, the Hot Night Roll arrived at my table. I chose this roll simply because it was the most expensive special roll out of all the choices under the lunch special. This roll consisted of prawn tempura, yam tempura, avocado, cucumber, spicy tuna, and crispy tempura crumbs along with their signature hot sauce. The sauces worked well together to create a creamy, sweet accompaniment to the roll. However, the "crispy crumbs" (which were actually yam fries) were rather hard and obtrusive and I had to pick them out of the spicy tuna in order to enjoy the soft texture of the tuna. For those who mind, the roll is a bit sauce-heavy. 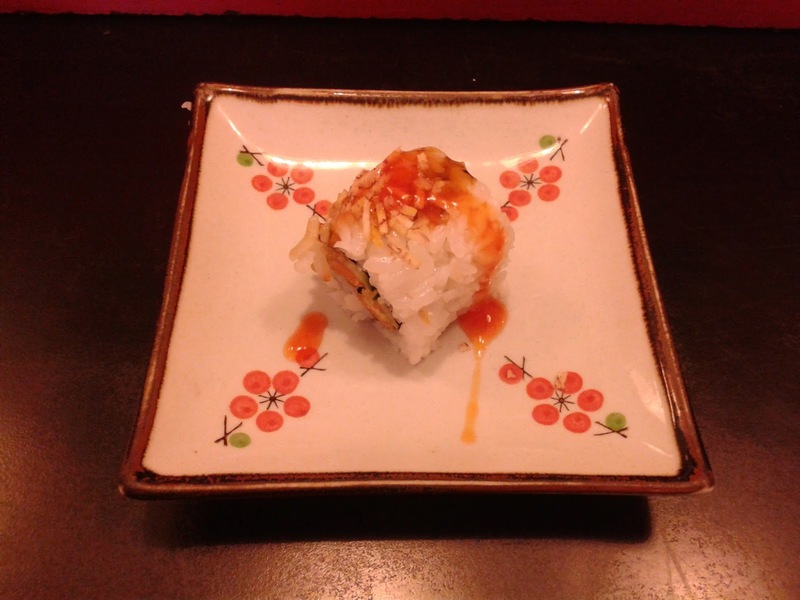 While I was eating the Hot Night Roll, the sushi chef presented me with a complimentary one-piece Yam Tempura Roll with Hot Sauce! I liked the nice tang of spiciness as well as the crispiness from the yam tempura. The Tempura came with one prawn, one green bean, and one piece each of carrot, sweet potato, and yam. 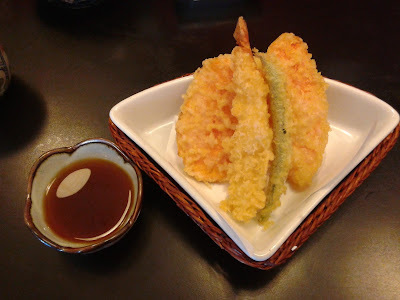 The oil used to fry the batter was slightly overused, but besides that, the Tempura was quite well-executed. The dipping sauce was the non-gingery kind (I don't have a preference for one over the other) and went well with every piece of tempura. The prawn was quite soft, the green bean was juicy (for a green bean), and the vegetables were sweet with ample moisture. I wasn't expecting first-class sushi rice, but the sushi rice here was adequately seasoned and not too tightly packed. The Toro Tataki was soft and juicy. Although I could see the sushi chef blowtorch the toro, it still lacked a seared flavour. The Unagi Nigiri, on the other hand, had a nice smoked flavour. The Sockeye Salmon Nigiri was a thin slice of mediocre freshness, while the Tuna Nigiri was surprisingly soft (to the point that I could confuse it with toro). The Atlantic Salmon Nigiri was weak in flavour and consisted of two pieces of salmon stacked on top of each other (the cutting was flawed). The Tai Nigiri was not tough at all, but it didn't have the smoothest texture. Oh my goodness ... I was presented with two more pieces of nigiri on the house! I got eight pieces of nigiri for the price of six! Now, this is a restaurant that truly tries to make its customers happy! I'm not a big fan of salmon toro (it's not even listed on the menu) due to its tougher texture, but here, they tried to alleviate that issue by slicing it thin. The masago on top was a nice touch. Out of all the nigiri, I would say that my favourite was the Saba Nigiri due to its excellent soft and silky texture. It had a surprisingly well-balanced taste too! The service was definitely on the friendlier side, and the servers were quite attentive except for the clearing of plates. However, they weren't totally at fault for this as I was sitting in a position that would have made it hard for them to clear off the dishes without distracting me from enjoying my meal. So far, this is the highest standard of food that I have experienced from a Japanese restaurant in Langley. At last, I have found a sushi restaurant in Langley that can compete with its sisters and brothers in Vancouver!